Religion and Enlightenment: What's the connection? 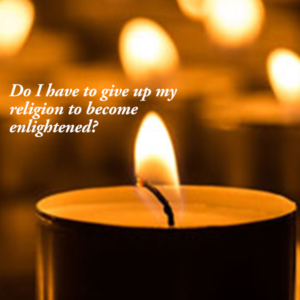 To the question, do you have to give up your religion to become enlightened, the simple answer is no. Self-realization, enlightenment, higher consciousness—these are spiritual concepts, but not necessarily religious. The practice of meditation and the calming of the mind are compatible with many different beliefs and traditions. Enlightenment is not the property of a particular religion. Catholic, Buddhist, Muslim, Sikh, Protestant—it doesn’t matter. What matters is your commitment to the practice of meditation and desire to follow your own path where it leads. You don’t have to leave your life and become a monk to achieve enlightenment. I’m living proof of that! The point is not to go off and become a hermit, away from the world, in order to achieve higher consciousness, but to permit your journey to help you lead the life you have to your full potential. Still have questions? Ask me and I’ll answer you! Next:Question of the Day: How do I stay motivated to meditate? Yes off course! You can..